As the presidents of three of the largest banks in Texas, Nikki Graham, Kerry Hall, and Rina Patel are building up the Austin community through better investing and a shared commitment to giving back. At the mere mention of working in finance, one might conjure up an image of a young, money-hungry Wall Street investment banker. It’s a persona that’s presumably justified, especially in Texas, a state that’s home to one of the largest pools of financial professionals in the country. Three women leading the pack in the Texas banking industry are Nikki Graham, Kerry Hall and Rina Patel. Venture to their downtown offices and you’ll surprisingly find any predispositions dashed. When it comes to that stereotypical, stigmatized image, they’re nothing of the sort. These experienced businesswomen are focused on making the best experience for customers and supporting their banking teams, all while working to improve the Austin community. This powerful trio of commercial and retail bank presidents is devoted to building a stronger Austin. Through involvement in numerous community causes and nonprofits, they work to promote equal access to education, economic growth and diversity in business. “I guess some people go into banking as a way to make money, but at least for most of the people I work with, that’s not their first motivation,” Bank of America’s Graham says. Her words ring true across the board for these three presidents. After graduating college, Graham’s dream was to work on Capitol Hill to improve people’s lives. Rather than pursuing that mission as a politician, Graham now works to improve the local community as the Austin market president for Bank of America. As president, Graham makes sure all divisions of the bank are working together and heads the company’s philanthropic engagement in Austin. “I always saw banking as another way to impact the community. We say that we’re here to make people’s financial lives better, and I thought that 23 years ago as much as I do now,” Graham says, referencing her years of work with Bank of America. After discovering her goal to one day work as a legislator didn’t pay very well starting out, Graham ended up working at the investment banking firm Shearson Lehman Brothers, her first exposure to the finance world. Looking back, Graham attributes her parents to teaching her a lot about banking during her childhood in South Carolina. By age 14, she was required to keep a meticulous checking account. Graham eventually left Washington, D.C. and returned to San Antonio, where she had attended high school. There, she worked her way up from the position of personal banker to a banking-center manager with Bank of America. Graham went on to work with Nations Bank, a job for which she traveled the country to help implement interstate banking, a new concept at the time. When Nations Bank acquired Bank of America, Graham returned to Texas to work as the market manager for the San Antonio and Austin markets. In 2013, Graham became the Austin market president for Bank of America. Graham says her willingness to adapt and tackle new projects has allowed her to explore many different areas of banking throughout her career. Graham advises young women to establish their strengths and goals early on in their careers. She says this allows for more confidence when taking on new roles. Bank of America gives employees two hours of paid time off each week to serve their local communities. Graham says this benefit and her team’s experiences volunteering help them not only connect with the city they serve, but also build leadership skills that translate back to the office. Graham’s current philanthropic work focuses on increasing access to education. She serves on the board of Communities in Schools of Central Texas, which works to prevent school dropouts by offering social services and resources. She further connects Austinites with educational opportunities as a board member at Capital Idea, a nonprofit focused on getting Austin workers employed by offering education and career services. Graham also serves on the board of Barton Springs Conservancy and the Greater Austin Chamber of Commerce. Graham’s mother worked in nonprofits and, although she studied at Auburn University, Graham spent summers working at the children’s clothing store her grandmother ran in Greenville, S.C. Her aunt now runs the business. With more than 30 years of experience in Texas banking, Hall knows the ins and outs of the state’s financial scene, as well as its complex history. Having joined Texas Capital Bank in 1999, Hall became president soon after and helped build the Austin region from the ground up. For Hall, it’s the golden rule of kindness that makes for good business, a motto she applies and exemplifies through her work with many philanthropic organizations, as well as her own banking team. As the Austin region president of Texas Capital Bank, Hall recruits a team of bankers to help expanding businesses grow with the help of loans and advising. The commercial bank works with a variety of local businesses, including Alamo Drafthouse, Kendra Scott Jewelry and The Texas Tribune. After studying finance at the University of Texas, Hall began her career as an internal auditor at mBank. She remembers being beat out by a male classmate for a position she really wanted in the credit training program. A true optimist, Hall stayed on and says working as an auditor allowed her to see how every department in a bank works. Two years later, she moved into the credit training program and became a commercial lender with mBank. Hall credits all the experiences she’s faced throughout her career, including setbacks and missteps, to making her a better banker. Amid the nationwide bank failures of the 1980s, Bank One bought out mBank. Hall was one of the few employees chosen to move over to Bank One, where she built and managed a unit of commercial bankers. In the late ’90s, Hall was asked to join the 2-year-old Texas Capital Bank. Although she admired the commercial bank started in her home state, Hall says she was nervous about leaving her longtime home of Bank One. Along the way to joining Texas Capital, Hall had two children, Hilary and Hudson, and was faced with the challenge of balancing her roles as mom and bank president. It was all about time management, Hall says, as well as accepting that she wouldn’t be able to help at every school volunteer opportunity and host every party. Hall was promoted to regional president of Texas Capital Bank in 2002. She was able to grow the bank with her own flair, deciding to add an emphasis on entrepreneurialism and giving back to the community. Soon thereafter, she helped launch Opportunity Austin, an economic-development initiative that promotes the creation of Central Texas jobs. In growing a healthy Austin economy, Hall says another vital part of the prosperity equation is access to education. She serves on the Champions Council of the E3 Alliance, a collaborative that works to break down barriers to education in Central Texas. Hall also serves on the boards of the Austin Convention and Visitors Bureau and Big Brothers Big Sisters of Central Texas. She says the local business community’s commitment to giving is what makes banking in Austin so unique. Working at her parent’s dry-cleaning business growing up, Patel developed a love of textiles and an unwavering work ethic. Her love of fashion led her to develop her own small business as a teenager, which eventually led to business school and her current role as the regional banking area president for Wells Fargo. The commitment to hard work never left her side. While in high school, Patel created her own fashion line called Rina Kishor. When the cost of New York City living caught up to her after a semester in design school at the Fashion Institute of Technology, Patel returned home to Arizona. There, Patel decided to focus on her interest in business. While studying at Arizona State University, Patel got a job through a friend as a bank teller at a local Wells Fargo branch. On the job, Patel found she loved helping people solve their financial problems. Patel has now been with the company for more than 14 years, working her way up through the ranks of teller, personal banker, service manager, branch manager, recruiting manager and district manager. 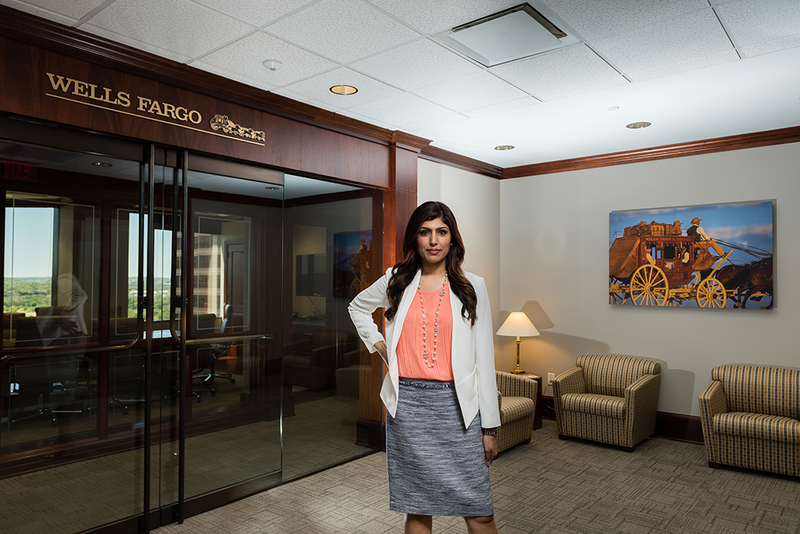 In 2013, Patel moved to Austin to take on her current role as the area president of Wells Fargo’s Mid-Central Texas Division. She now oversees Wells Fargo employees who hold many of her own previous jobs. Patel says her main focus as president is helping the bank’s customers. As the area president, Patel says she makes an effort to start every day with a positive attitude. Patel cites her parents, who emigrated from India to Houston in the 1970s with only a couple hundred dollars in their pockets, as her major motivation throughout her career. She says her parents raised her to be grateful for what she had and work hard for what she wanted. That mindset led Patel through a number of childhood entrepreneurial ventures. Even before her fashion line, Patel remembers going door to door at her apartment complex as a kid, selling friendship bracelets out of a red wagon. After the bracelets came selling Girl Scout Cookies, which Patel says taught her money-management skills. Patel now helps instill those same values in young girls through her position on the board of Girl Scouts of Central Texas and as a part of the organization’s Juliette’s Circle. Patel’s division of Wells Fargo also works with Girl Scouts and local schools to teach financial literacy to students. Since taking on management roles with Wells Fargo, Patel has taken her teams out for monthly volunteer projects, a tradition her own family had while she was growing up. Patel serves on the board of United Way for Greater Austin, as well as with the group’s Development Committee and Women’s Leadership Council. She frequently speaks about the importance of diversity and increasing opportunities for women in leadership roles. As for women starting out in business, Patel advises them to let go of fear and work their hardest. Austin Woman asked the bank presidents to share their best tips for achieving financial success. Start saving sooner rather than later.